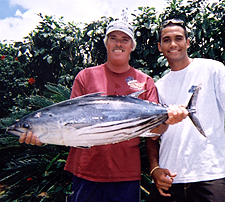 Locally known as aku, skipjack are a common catch on Hawai'i boats. They are a popular bait for big pelagic fish like tuna, sharks and marlin. The state record was weighed in by David Borgman who was trolling in 1,000 fathoms of water 25 miles off Hale'iwa on the island of O'ahu.